Guadalupe Peak, highpoint of Texas. Birth of an obsession. And giant freaking bugs. Guadalupe Peak, highpoint of Texas. This is the trip that started my love of highpointing. I hadn't really given it much thought before this trip. At the time the main reason I went was because I was really into the national parks, and the highpoint of Texas is in Guadalupe Mountains National Park. I still love the national parks and would like to visit all of them at some point. So during my time living in Houston, my friend Todd and I took a week off in the summer of 2001 to hit three national parks: Big Bend, Guadalupe Mountains, and Carlsbad Caverns. Big Bend was stunning, with its hiking trails through the Chisos Mountains and views across the Rio Grande into Mexico. Next, we hit a few spots along the Mexican border and the town of Marfa (we tried seeing the mysterious lights but no luck). Then it was on to Guadalupe! 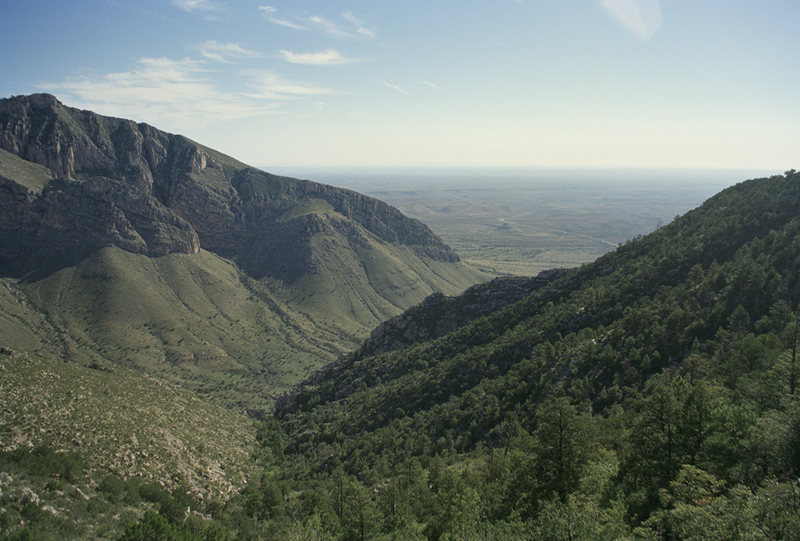 The Guadalupe Mountains rise from the otherwise flat terrain of West Texas and are visible for many miles before arriving there. As we approached from the south, the parks most famous feature, El Capitan, greeted us as it stoically stood watch over the landscape. After checking in at the park headquarters, Todd and I set up our tents in the campground. We were sitting at the picnic table enjoying dinner and some conversation when the terror struck... Earlier in the park headquarters we saw a display of the local fauna. It included an insect called a tarantula hawk. It's a type of wasp that is several inches across, big enough to throw down with tarantulas. And kill them... So as Todd and I were sitting there at our picnic table, one of these tarantula hawks landed on Todd's nalgene water bottle. It covered the whole top of the bottle. I would have taken a picture of it but I was too busy fleeing in horror from the murder-wasp. I was never a big fan of wasps and this one was freakishly huge. And the cavalcade of indigenous species wasn't over. Later on while returning to my tent from the restrooms, I came upon a tarantula in the middle of the trail. We just stood there, staring at each other. I was much more fascinated than frightened with this guy, unlike the wasp. I inched closer and closer, never taking my eyes off of it. 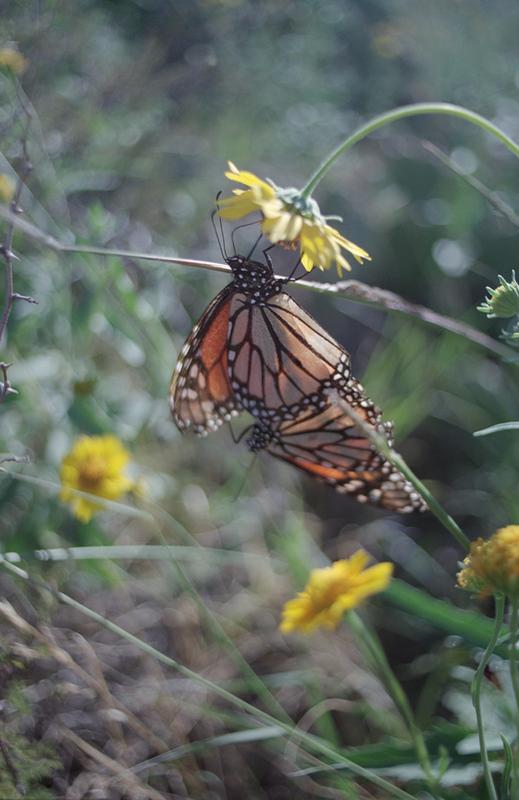 Eventually I got close enough where I made it uncomfortable and it moved. Fast. It covered two feet in the blink of an eye. In movies they're always shown as kind of slow, lumbering creatures, so I was taken by surprise at how fast it could move. We also met another tarantula in the parking lot. We decided to poke it with a stick (actually it was more like gently touch it with a stick). Either way, it didn't like it. It reared up on its six back legs and its front two legs were raised in the air as if he was shouting "Come at me bro!". I like to think that the two tarantulas and the tarantula hawk found each other that night and had an epic Godzilla/Rodan/Ghidorah style battle royal. After tangling with the local wildlife, we called it a night and got an early start on the summit trail. It was a beautiful day for hiking. The skies were clear, it wasn't too blistering hot, and we already had one big hike under our belt this week so we were feeling confident. It was going to be a fairly long day. The trail to the summit is just over four miles from trailhead to summit, with an elevation gain of around 3,000 ft. Nothing to it but to do it. We began the long climb to the top. Unlike the hike in Big Bend a few days prior, this hike was nothing but up. We kept marching our way toward the top. Eventually my legs stared feeling heavy. The closer we got to the top the more on autopilot I felt. One foot in front of the other, over and over again. Todd and I at the summit of Guadalupe Peak. Then, just like that, we were at the top. We made it! The top of Texas. The view from the summit was spectacular. I could see for many miles. And now El Capitan, the feature that towered over us when we approached the park, was situated below us. We stayed at the top for about an hour, just taking in the view. One interesting feature that stood out was the salt flats to west of the park. In the panorama above, they are the lighter areas in the distance to the right of center. While at the top we made the obligatory play on words drug joke about being higher than anyone else in the entire state of Texas. In my head though, I really thought about that idea of standing of the highest point in a state. Its not something a lot of people get to experience, or for that matter, realize that its even a thing to be experienced. It would be a few more years before my next highpoint (Mount Marcy, in my home state of New York in 2004), but it was this trip that planted the seed of a goal to visit all the 50 highpoints.